Since the late 1980s, most of the world has had a clearer conscience whenever they bought aerosol hairspray or foam insulation. This is because, in 1987, all UN countries signed The Montreal Protocol with the intention of phasing out the harmful chemicals responsible for depleting the ozone layer, the part of the stratosphere that protects the earth from harmful UV rays. Many of the chemicals banned in the agreement included refrigerants and foam insulation materials. The main culprit for ozone depletion was CFCs, or chlorofluorocarbons, which, according to National Oceanic and Atmospheric Administration, “are non-toxic, non-flammable chemicals containing atoms of carbon, chlorine, and fluorine. They are used in the manufacture of aerosol sprays, blowing agents for foams and packing materials, as solvents, and as refrigerants.” Unfortunately, studies have shown that, in the past few years, the hole in the ozone has taken longer to repair. 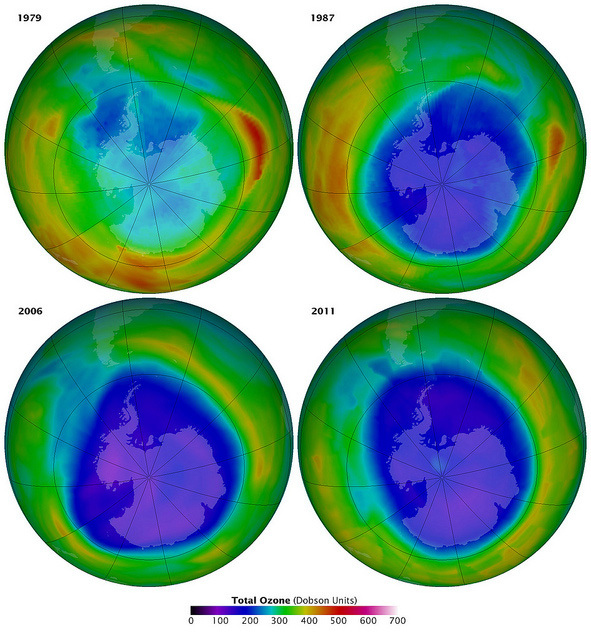 The goal of the Montreal Protocol was to have the hole in the ozone closed by the middle of the century, as long as all countries complied with banning the manufacture and use of most CFCs. Alternative technologies had already been researched and tested for use as refrigerants and aerosols. Yet, recently, a New York Times investigation discovered that, in China, the use of one of the banned chemicals, CFC-11, in some factories is ongoing. The major culprits were from refrigerator manufacturers and construction companies using CFC-11 foam insulation. China has been cracking down on the use of such chemicals, but many of the factories are small and difficult to regulate. Obtaining some CFCs is still relatively easy in China, though tracking and penalizing those in charge of illegal chemical production remains difficult for Chinese officials. When most people think of CFCs, they often think of aerosols, which include many of our everyday products. Essentially anything in a pressurized can, including hairspray and spray paint, is an aerosol. These products used to contain CFCs, but have since been manufactured with approved chemicals. Though not harmless to the environment, their effects are significantly less damaging to the stratosphere. China produces many of the world’s goods; it is easy to take for granted how many of the products we use on a regular basis come from there, and even easier to ignore the fact that, in many western nations, air quality is so much better because our manufacturing sectors have become such small parts of our economies. Yet, even though China has a large economy that so much of the world relies on, it does not mean that the people of China don’t believe that they deserve clean air or want a healthy environment. Part of China’s push for environmental stewardship is due to its desire to keep trust in the Government high. Chinese officials are cracking down on the chemical industry, banning more and more products, including those that can be used to make banned chemicals, but, as has been shown time and time again, regulation means little without enforcement. Western nations blame many of the world’s environmental problems on China’s seemingly lax environmental oversight and brazen use of harmful substances, while still demanding their products. It is easy to point the finger, yet the foundation of many western economies was built on practices we now know are extremely harmful to the environment. There is enough information about the effects and alternatives available to stop the use of CFCs, and China would do well to assist its industries in complying with new regulations by educating them on options, and perhaps subsidising conversion to safer technologies.